What's that you say? An award winning movie turned into a big Broadway musical? When does that ever happen? I'm kidding of course. It happens more often than you think. In fact just yesterday I posted a blog on An American In Paris which won the Academy Award winner for Best Picture of the Year. Now while Doctor Zhivago did not win the top prize it was nominated and did take home the prize for Best Adapted Screenplay and Best Cinematography. At least that's something right? The movie which will celebrate it's 50th Anniversary later this year is now on Broadway. Only this time people are singing. I mean that's what one does in a musical after all. Now I have never seen the movie although I'm sure that most if not all of the people who are purchasing tickets to the show have. However for those of you who would like to know a little bit more about Doctor Zhivago here is a little more info about it. Enjoy! Doctor Zhivago is an epic romance set during the final days of Czarist Russia, the First World War and the chaos of the Russian revolution. Raised as an aristocrat, Zhivago is a political idealist, physician and poet whose life is tossed by the tides of history as he is torn between a life with his devoted wife, Tonia Gromeko and the passionate and mysterious Lara Guishar. Zhivago is not alone in his yearnings for Lara, competing for her affections with the young revolutionary Pasha Antipov, and the aristocrat Viktor Komarovsky. Doctor Zhivago celebrates the strength of love and art, in the face of political oppression, war and revolution. Kind of sounds like the Russian Les Miz doesn't it? O.K. that may be pushing it but there are worst things it can be compared to then one of the world's most successful musicals of all time. Am I right? Now for those of you Doctor Zhivago fans out there that want to see the musical version you have come to the right place. We sell tickets for it. In fact if you call now we can get you tickets to see the show at prices that are lower than ever. Be advised that while this "Insider Price" is good thru May 24 it is for select seats and as always subject to availability. 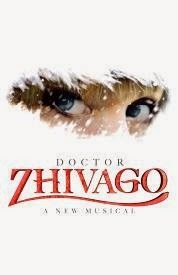 Get your tickets to see Doctor Zhivago on Broadway. Until next time theatre fans.